BLACK FOREST - Easy to reach ! Take autobahn 5 Karlsruhe - Basel. 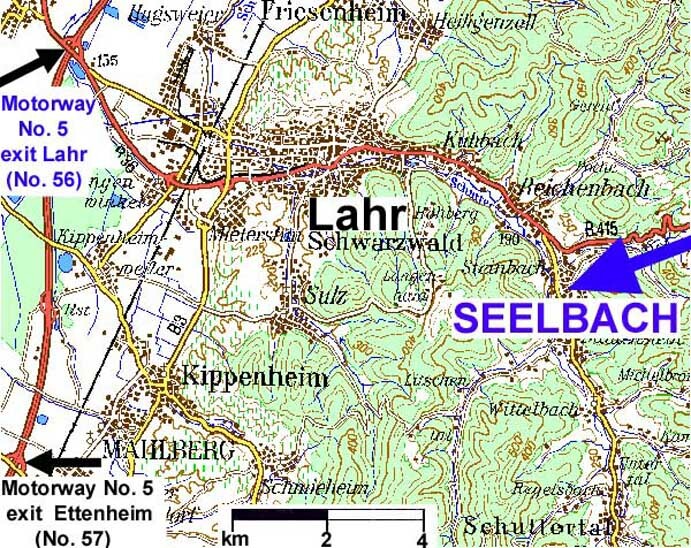 Get off the autobahn at the sign for Lahr, km 714, exit 56. 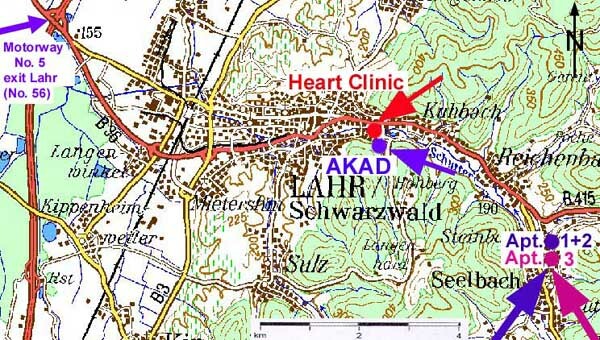 Turn left toward direction Lahr / Kinzigtal / Biberach. This will be Route B 36 at first/later Route B 415. 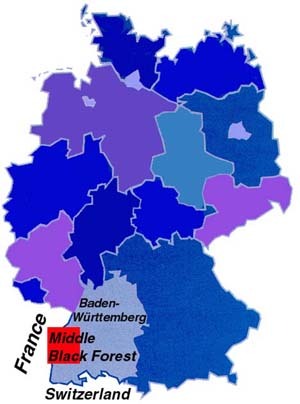 Pass through the city of Lahr and its suburbs Lahr-Kuhbach and Lahr-Reichenbach. 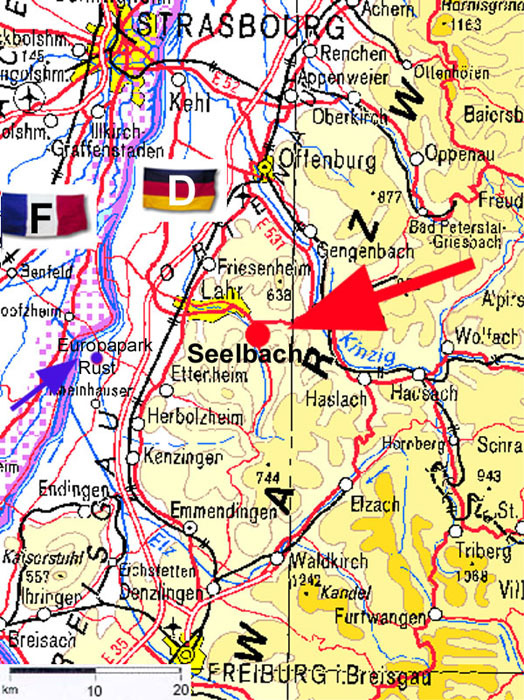 Immediately after you leave Reichenbach, watch for the sign for Seelbach/Schuttertal to the right. 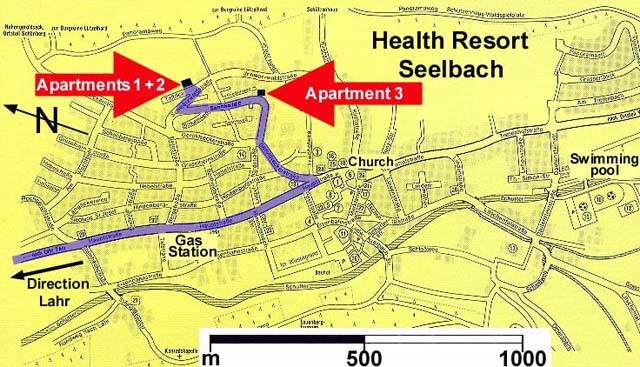 Than after 1 km you reach a circle (in front of the village Seelbach) drive straight ahead over the circle, continue for about 1 km (0.62 miles) until you see the pedestrian light. Twenty meters (22 yards) before the light (which is about 150 m (164 yards) before the church), take a sharp turn to the left (you will have the impression that you turn back in the old direction). Follow strictly the right curbstone (the road has two slight curves) for about 300 m (328 yards) until you reach Sonnhalde. Follow Sonnhalde uphill. After 150 m (164 yards), you will come to your destination Sonnhalde 11, which is on your right. 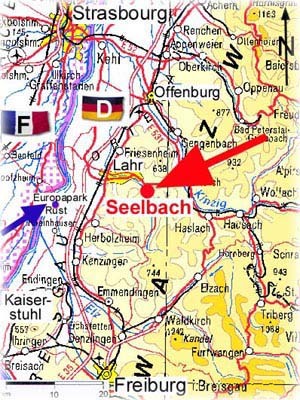 If you travel by train, we should be happy to fetch you either from the train station in Offenburg, where the ICE train stops, or from the train station in Lahr/Schwarzwald, where the interRegio train "Höllental" stops. Lahr Info: 125,175 MHz, Elev. 508 ft, runway 03/21 - 3000 m x 45 m, Tel. OPS 0 78 21 / 994-200, Tower 0 78 21 / 95 55 76. Please inform us in advance as to your travel time. We should be happy to fetch you from either the train station or the airport in Lahr. In case of need, we should be happy to help you with the rental of a car. BLACK FOREST - To be on intimate terms with nature !